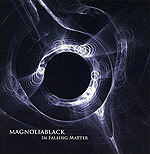 CD review: "In Falling Matter"
This review first appeared in the Oct. 4, 2007 issue of the North County Times. Hard-driving, metal-tinged alternative rock with bright, radio-friendly melodic themes, the music of San Diego's Magnoliablack has an urgency, an energy that is difficult to resist. The band's sound is built around the strong vocals of Robert Rivera, who handles everything from the ska-influenced opening track through the anthemic "A Circle Squared" to the death metal of the closing track, "Storming Mount Weather." The four-piece (two guitars, bass, drums) band provides a solid, polished, even shimmering backdrop for Rivera's dramatic singing, and several of the tracks have a nice, pop-oriented melody that would fit quite comfortably on any alt rock radio playlist. Just 30 minutes long, this seven-song EP showcases a local band with aspirations for the big time, and the talent to back it up.